Not to be confused with Later Three Kingdoms. The three kingdoms occupied the entire Korean Peninsula and roughly half of Manchuria, located in present-day China and Russia . The kingdoms of Baekje and Silla dominated the southern half of the Korean Peninsula and Tamna, whereas Goguryeo controlled the Liaodong Peninsula, Manchuria and the northern half of the Korean Peninsula. Baekje and Goguryeo shared founding myths and originated from Buyeo. In the 7th century, allied with China under the Tang dynasty, Silla unified the Korean Peninsula for the first time in Korean history, forming a united Korean national identity for the first time. After the fall of Baekje and Goguryeo, the Tang dynasty established a short-lived military government to administer parts of the Korean peninsula. However, as a result of the Silla–Tang War (≈670–676), Silla forces expelled the Protectorate armies from the peninsula in 676. The following period is known as the Unified Silla or Later Silla (668–935). Beginning in the 7th century, the name "Samhan" became synonymous with the Three Kingdoms of Korea. The "Han" in the names of the Korean Empire, Daehan Jeguk, and the Republic of Korea (South Korea), Daehan Minguk or Hanguk, are named in reference to the Three Kingdoms of Korea. According to the Samguk sagi and Samguk yusa, Silla implemented a national policy, "Samhan Unification" (Hangul: 삼한일통), to integrate refugees and migrants from Baekje and Goguryeo. In 1982, a memorial stone dating back to 686 was discovered in Cheongju with an inscription: "The Three Han were unified and the domain was expanded." During the Later Silla period, the concepts of Samhan as the ancient confederacies and the Three Kingdoms of Korea were merged. In a letter to an imperial tutor of the Tang dynasty, Choe Chiwon equated Byeonhan to Baekje, Jinhan to Silla, and Mahan to Goguryeo. By the Goryeo period, Samhan became a common name to refer to all of Korea. In his Ten Mandates to his descendants, Wang Geon declared that he had unified the Three Han (Samhan), referring to the Three Kingdoms of Korea. Samhan continued to be a common name for Korea during the Joseon period and was widely referenced in the Annals of the Joseon Dynasty. In China, the Three Kingdoms of Korea were collectively called Samhan since the beginning of the 7th century. The use of the name Samhan to indicate the Three Kingdoms of Korea was widespread in the Tang dynasty. Goguryeo was alternately called Mahan by the Tang dynasty, as evidenced by a Tang document that called Goguryeo generals "Mahan leaders" (마한추장; 馬韓酋長) in 645. In 651, Emperor Gaozong of Tang sent a message to the king of Baekje referring to the Three Kingdoms of Korea as Samhan. Epitaphs of the Tang dynasty, including those belonging to Baekje, Goguryeo, and Silla refugees and migrants, called the Three Kingdoms of Korea "Samhan", especially Goguryeo. For example, the epitaph of Go Hyeon (고현; 高玄), a Tang dynasty general of Goguryeo origin who died in 690, calls him a "Liaodong Samhan man" (요동 삼한인; 遼東 三韓人). The History of Liao equates Byeonhan to Silla, Jinhan to Buyeo, and Mahan to Goguryeo. The name "Three Kingdoms" was used in the titles of the Korean histories Samguk sagi (12th century) and Samguk yusa (13th century), and should not be confused with the Three Kingdoms of China. The Three Kingdoms was founded after the fall of Wiman Joseon, and gradually conquered and absorbed various other small states and confederacies. After the fall of Gojoseon, the Han dynasty established four commanderies in present Liaoning. Three fell quickly to the Samhan, and the last was destroyed by Goguryeo in 313. The nascent precursors of Baekje and Silla expanded within the web of statelets during the Proto Three Kingdoms Period, and Goguryeo conquered neighboring state like Buyeo in Manchuria and chiefdoms in Okjeo, Dongye which occupied the northeastern Korean peninsula. The three polities made the transition from walled-town state to full-fledged state-level societies between 1st – 3rd century AD. All three kingdoms shared a similar culture and language. Their original religions appear to have been shamanistic, but they were increasingly influenced by Chinese culture, particularly Confucianism and Taoism. In the 4th century, Buddhism was introduced to the peninsula and spread rapidly, briefly becoming the official religion of all three kingdoms. Goguryeo emerged on the north and south banks of the Yalu (Amrok) River, in the wake of Gojoseon's fall. The first mention of Goguryeo in Chinese records dates from 75 BC in reference to a commandery established by the Chinese Han dynasty, although even earlier mentions of "Guri" (구리) may be of the same state. 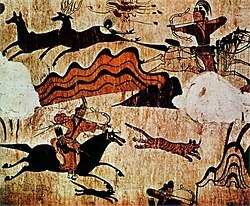 Evidence indicates Goguryeo was the most advanced, and likely the first established, of the three kingdoms. Goguryeo, eventually the largest of the three kingdoms, had several capitals in alternation: two capitals in the upper Yalu area, and later Nangrang (Lelang in Chinese) which is now part of Pyongyang. At the beginning, the state was located on the border with China; it gradually expanded into Manchuria and destroyed the Chinese Lelang commandery in 313. 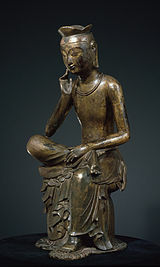 The cultural influence of the Chinese continued as Buddhism was adopted as the official religion in 372. Goguryeo was a highly militaristic state; it was a powerful empire and one of the great powers in East Asia. The state was at its zenith in the fifth century, during the rule of King Gwanggaeto the Great and his son King Jangsu, and particularly during their campaign in Manchuria. For the next century or so, Goguryeo was the dominant nation in Manchuria and the Korean peninsula. Goguryeo eventually occupied the Liaodong Plains in Manchuria and today's Seoul area. Gwanggaeto achieved a loose unification of the Three Kingdoms of Korea. Goguryeo controlled not only Koreans but also Chinese and Tungusic tribes in Manchuria. After the establishment of the Sui Dynasty and later the Tang Dynasty in China, the state continued to take aggressive actions against China, Silla, and Baekje until it was conquered by allied Silla–Tang forces in 668. Most of its territory was absorbed by Tang Dynasty China and the territory of Baekje was absorbed by Silla. Baekje was founded as a member of the Mahan confederacy. Two sons of the founder of Goguryeo are recorded to have fled a succession conflict, to establish Baekje around the present Seoul area. Baekje absorbed or conquered other Mahan chiefdoms and, at its peak in the 4th century, controlled most of the western Korean peninsula. Buddhism was introduced to Baekje in 384 from Goguryeo, which Baekje welcomed. Baekje was a great maritime power; its nautical skill, which made it the Phoenicia of East Asia, was instrumental in the dissemination of Buddhism throughout East Asia and continental culture to Japan. Baekje played a fundamental role in transmitting cultural and material developments to ancient Japan, including Chinese written characters, Chinese and Korean literature, technologies such as ferrous metallurgy and ceramics, architectural styles, sericulture and Buddhism. Baekje exerted its political influence on Tamna, a kingdom that ruled Jejudo. Baekje maintained a close relationship with and extracted tribute from Tamna. Baekje's religious and artistic culture influenced Goguryeo and Silla. Baekje was once a great military power on the Korean Peninsula, especially during the time of Geunchogo, but was critically defeated by Gwanggaeto and declined. In the late 5th century, under attack from Goguryeo, the capital of Baekje was moved south to Ungjin (present-day Gongju) and later further south to Sabi (present-day Buyeo). According to Korean records, in 57 BC, Seorabeol (or Saro, later Silla) in the southeast of the peninsula unified and expanded the confederation of city-states known as Jinhan. Although Samguk Sagi records that Silla was the earliest-founded of the three kingdoms, other written and archaeological records indicate that Silla was likely the last of the three to establish a centralized government. Silla was the smallest and weakest of the Three Kingdoms of Korea, but it used cunning diplomatic means to make opportunistic pacts and alliances with the more powerful Korean kingdoms, and eventually Tang China, to its great advantage. Renamed from Saro to Silla in 503, the kingdom annexed the Gaya confederacy (which in turn had absorbed Byeonhan earlier) in the first half of the 6th century. Goguryeo and Baekje responded by forming an alliance. To cope with invasions from Goguryeo and Baekje, Silla deepened its relations with the Tang Dynasty, with her newly gained access to the Yellow Sea making direct contact with the Tang possible. After the conquest of Goguryeo and Baekje with her Tang allies, the Silla kingdom drove the Tang forces out of the peninsula and occupied the lands south of Pyongyang. The capital of Silla was Seorabeol (now Gyeongju; "Seorabeol", "서라벌", is hypothesized to have been the ancient Korean term for "capital"). Buddhism became the official religion in 528. The remaining material culture from the kingdom of Silla including unique gold metalwork shows influence from the northern nomadic steppes, differentiating it from the culture of Goguryeo and Baekje where Chinese influence was more pronounced. Allied with China under the Tang dynasty, Silla conquered Goguryeo in 668, after having already conquered Gaya in 562 and Baekje in 660, thus ushering in the North-South states period with Later Silla to the south and Balhae to the north, when Dae Jo-young, a former Goguryeo military officer, revolted against Tang Chinese rule and began reconquering former Goguryeo territories. Archaeologists use theoretical guidelines derived from anthropology, ethnology, analogy, and ethnohistory to the concept of what defines a state-level society. This is different from the concept of state (guk or Sino ko: 國, walled-town state, etc.) in the discipline of Korean History. In anthropological archaeology the presence of urban centres (especially capitals), monumental architecture, craft specialization and standardization of production, ostentatious burials, writing or recording systems, bureaucracy, demonstrated political control of geographical areas that are usually larger in area than a single river valley, etc. make up some of these correlates that define states. Among the archaeology sites dating to the Three Kingdoms of Korea, hundreds of cemeteries with thousands of burials have been excavated. The vast majority of archaeological evidence of the Three Kingdoms Period of Korea consists of burials, but since the 1990s there has been a great increase in the archaeological excavations of ancient industrial production sites, roads, palace grounds and elite precincts, ceremonial sites, commoner households, and fortresses due to the boom in salvage archaeology in South Korea. Rhee and Choi hypothesize that a mix of internal developments and external factors lead to the emergence of state-level societies in Korea. A number of archaeologists including Kang demonstrate the role of frequent warfare in the development of peninsular states. Historic example of a climbing kiln similar to those that were excavated from Songok-dong and Mulcheon-ri as early as the late Three Kingdoms Period, c. 600. Some individual correlates of complex societies are found in the chiefdoms of Korea that date back to c. 700 BC (e.g. see Igeum-dong, Songguk-ri). However, the best evidence from the archaeological record in Korea indicates that states formed between 300 BC and 300/400 AD. However, archaeologists are not prepared to suggest that this means there were states in the BC era. The correlates of state-level societies did not develop as a package, but rather in spurts and starts and at various points in time. It was some time between 100–400 AD that individual correlates of state societies had developed to a sufficient number and scale that state-level societies can be confidently identified using archaeological data. Lee Sung-joo analyzed variability in many of the elite cemeteries of the territories of Silla and Gaya polities and found that as late as the 2nd century there was intra-cemetery variation in the distribution of prestige grave goods, but there was an absence of hierarchical differences on a regional scale between cemeteries. Near the end of the 2nd century AD, interior space in elite burials increased in size, and wooden chamber burial construction techniques were increasingly used by elites. In the 3rd century, a pattern developed in which single elite cemeteries that were the highest in status compared to all the other cemeteries were built. Such cemeteries were established at high elevations along ridgelines and on hilltops. Furthermore, the uppermost elite were buried in large-scale tombs established at the highest point of a given cemetery. Cemeteries with 'uppermost elite' mounded burials such as Okseong-ri, Yangdong-ri, Daeseong-dong, and Bokcheon-dong display this pattern. Roof tiles excavated from Goguryeo archaeological sites in the Han River valley, from National Museum of Korea. Lee Sung-joo proposed that, in addition to the development of regional political hierarchies as seen through analysis of burials, variation in types of pottery production gradually disappeared and full-time specialization was the only recognizable kind of pottery production from the end of the 4th century A.D. At the same time the production centers for pottery became highly centralized and vessels became standardized. Centralisation and elite control of production is demonstrated by the results of the archaeological excavations at Songok-dong and Mulcheon-ni in Gyeongju. These sites are part of what was an interconnected and sprawling ancient industrial complex on the northeast outskirts of the Silla capital. Songok-dong and Mulcheon-ri are an example of the large-scale of specialized factory-style production in the Three Kingdoms and Unified Silla Periods. The site was excavated in the late 1990s, and archaeologists found the remains of many production features such as pottery kilns, roof-tile kilns, charcoal kilns, as well as the remains of buildings and workshops associated with production. Since the establishment of Goguryeo, its early history is well attested archaeologically: The first and second capital cities, Jolbon and Gungnae city, located in and around today's Ji'an, Jilin. In 2004, the site was designated as a World Heritage Site by UNESCO. Since 1976, continuing archaeological excavations concentrated in the southeastern part of modern Gyeongju have revealed parts of the so-called Silla Wanggyeong (Silla royal capital). A number of excavations over the years have revealed temples such as Hwangnyongsa, Bunhwangsa, Heungryunsa, and 30 other sites. Signs of Baekje's capitals have also been excavated at the Mongchon Fortress and the Pungnap Fortress in Seoul. ^ Kotkin, Stephen; Wolff, David (2015-03-04). Rediscovering Russia in Asia: Siberia and the Russian Far East: Siberia and the Russian Far East. Routledge. ISBN 9781317461296. Retrieved 15 July 2016. ^ a b c d e f g 이기환 (30 August 2017). "[이기환의 흔적의 역사]국호논쟁의 전말…대한민국이냐 고려공화국이냐". 경향신문 (in Korean). The Kyunghyang Shinmun. Retrieved 2 July 2018. ^ a b c d 이덕일. "[이덕일 사랑] 대~한민국". 조선닷컴 (in Korean). Chosun Ilbo. Retrieved 2 July 2018. ^ a b c "고현묘지명(高玄墓誌銘)". 한국금석문 종합영상정보시스템. National Research Institute of Cultural Heritage. Retrieved 10 September 2018. ^ a b Deok-young, Kwon (2014). "An inquiry into the name of Three Kingdom(三國) inscribed on the epitaph of T'ang(唐) period". The Journal of Korean Ancient History (in Korean). 75: 105–137. ISSN 1226-6213. Retrieved 2 July 2018. ^ Hong, Wontack (2005). "The Puyeo-Koguryeo Ye-maek the Sushen-Yilou Tungus, and the Xianbei Yan" (PDF). East Asian History: A Korean Perspective. 1 (12): 1–7. ^ Walker, Hugh Dyson (November 2012). East Asia: A New History. AuthorHouse. p. 104. ISBN 9781477265161. Retrieved 21 November 2016. ^ a b Walker, Hugh Dyson (2012-11-20). East Asia: A New History. AuthorHouse. pp. 6–7. ISBN 9781477265178. Retrieved 21 November 2016. ^ a b c Korea's Three Kingdoms Archived 2011-05-16 at the Wayback Machine. Ancientworlds.net (2005-06-19). Retrieved on 2015-11-15. ^ Kim, Jinwung (2012-11-05). A History of Korea: From "Land of the Morning Calm" to States in Conflict. Indiana University Press. p. 35. ISBN 978-0253000781. Retrieved 11 October 2016. ^ Pratt, Chairman Department of East Asian Studies Keith; Pratt, Keith; Rutt, Richard (2013-12-16). Korea: A Historical and Cultural Dictionary. Routledge. p. 135. ISBN 9781136793936. Retrieved 22 July 2016. ^ Yu, Chai-Shin (2012). The New History of Korean Civilization. iUniverse. p. 27. ISBN 9781462055593. Retrieved 22 July 2016. ^ Kim, Jinwung (2012-11-05). A History of Korea: From "Land of the Morning Calm" to States in Conflict. Indiana University Press. p. 28. ISBN 978-0253000781. Retrieved 22 July 2016. ^ Ebrey, Patricia Buckley; Walthall, Anne; Palais, James B. (2013). East Asia: A Cultural, Social, and Political History, Volume I: To 1800. Cengage Learning. p. 104. ISBN 978-1111808150. Retrieved 12 September 2016. ^ Farris, William Wayne, Japan to 1600: A Social and Economic History. Honolulu: University of Hawaii Press, 2009, pp 68–87, 97-99, 101-105, 109-110, 116, 120–122. ^ A Brief History of Korea. Ewha Womans University Press. 2005-01-01. pp. 29–30. ISBN 9788973006199. Retrieved 21 November 2016. ^ Wells, Kenneth M. (2015-07-03). Korea: Outline of a Civilisation. BRILL. pp. 18–19. ISBN 9789004300057. Retrieved 12 September 2016. ^ a b c d Rhee, S.N. & Choi, M.L. (1992). "Emergence of complex society in Korea". Journal of World Prehistory. 6: 51–95. doi:10.1007/BF00997585. ^ a b Kang, Bong-won. (1995). The role of warfare in the formation of state in Korea: Historical and archaeological approaches. PhD dissertation. University of Oregon, Eugene. Ann Arbor: University Microfilms. ^ a b Kang, Bong-won (2000). "A test of increasing warfare in the Samguk Sagi against the archaeological remains in Yongnam, South Korea". Journal of East Asian Archaeology. 2 (3): 139–197. doi:10.1163/156852300760222100. ^ Bale, Martin T. & Ko, Min-jung (2006). "Craft Production and Social Change in Mumun Pottery Period Korea" (PDF). Asian Perspectives. 45 (2): 159–187. doi:10.1353/asi.2006.0019. hdl:10125/17250. ^ Barnes, Gina L. (2004). "The emergence and expansion of Silla from an archaeological perspective". Korean Studies. 28: 14–48. doi:10.1353/ks.2005.0018. JSTOR 23720181. ^ a b c Lee, Sung-joo. (1998). Silla–Gaya Sahwoe-eui Giwon-gwa Seongjang [The Rise and Growth of Society in Silla and Gaya]. Seoul: Hakyeon Munhwasa. ^ Pai, Hyung Il. (1989). "Lelang and the "interaction sphere": An alternative approach to Korean state formation". Archaeological Review from Cambridge. 8 (1): 64–75. Best, J.W. (2003). "Buddhism and polity in early sixth-century Paekche". Korean Studies. 26 (2): 165–215. doi:10.1353/ks.2004.0001. JSTOR 23719761. Lee, K. (1984) . A New History of Korea. Tr. by E.W. Wagner & E.J. Schulz. Seoul: Ilchogak. p. 518. ISBN 9780674615762. Na, H.L. (2003). "Ideology and religion in ancient Korea". Korea Journal. 43 (4): 10–29. Archived from the original on June 14, 2011. Nelson, Sarah M. (1993). The archaeology of Korea. Cambridge: Cambridge University Press. ISBN 9780521407830. Pearson, R; Lee, J.W. ; Koh, W.Y. ; Underhill, A. (1989). "Social ranking in the Kingdom of Old Silla, Korea: Analysis of burials". Journal of Anthropological Archaeology. 8 (1): 1–50. doi:10.1016/0278-4165(89)90005-6. Scopus: 2-s2.0-38249024295.